So, to alternative engines that are not internal combustion. Give a cautious welcome to the external combustion engine. But first, let’s review the use of the very common electric motor and its variants. 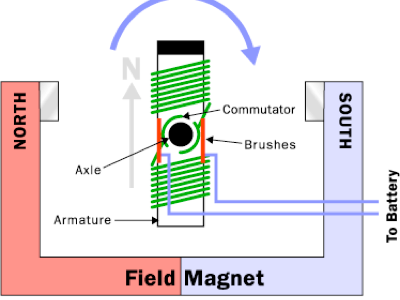 Maglev trains (magnetic levitation) work by using the attraction between magnets for the suspension element¹ and then use linear motors for propulsion. I recognise that this is vague. Advantages of maglev include: being relatively impervious to weather, having potentially high speeds; low running costs; no wheels to worry about. See essay 169. There are surprisingly few completed maglev projects around the world; if you get the chance to experience one, take it; I liked the maglev into Shanghai from the airport, exceeding 300kph. Incidentally, maglevs with wheels are not truly maglevs at all, though I can appreciate the caution of wanting some wheels available just in case of failure². Steam is an external combustion engine because the steam is separate from the exhaust gases. We are familiar with its use for train drive units. The big advantage is immense power at low speed. The Newcomen engine is used for pumping and you probably have an image of this when you think of oilfields. Image to right. In principle an ECE has the internal fluid heated by an external source; the internal fluid is heated by heat transfer through the chamber wall or a heat exchanger; the internal fluid expands to produce motion and usable work. Paraphrased In a closed-cycle ECE the fluid is then cooled and reused and if an open-cycle, the fluid is dumped and cool fluid pulled in, as in an open cycle air engine. I found here a criticism of ECEs in general: they are huge and heavy; they do not start at once; they are unsafe to use; they have low efficiency. These are reducible problems and I deem the author to be biased, if unconsciously. There is a difference between the state of design now for ICE and ECE and what the technology could deliver. In the case of steam, the boiler is under pressure and needs to be well designed for safety, much as say the fuel tank and combustion chamber for ICE does. Steam is inefficient (how do we measure that?) because the steam temperature is low – a clear case for development, then. The slow starting has three solutions; (i) use it in conjunction with something like electric motors (as we would for cars) or (ii) use it in cases where we don’t mind at all (trains and power stations) and (iii) find better solutions, such as the flash boiler. As to size/weight, I wonder how we measure that, a point I hope to come back to. Included in that is the huge over-design found in steam engines What is acceptable shell strength – four times or forty? Similarly, efficiency is an issue: At the moment I read that a petrol ICE reaches 40%, a diesel 35% (yet in several places diesel is ‘more efficient than petrol’, while steam reaches 20%. A clear need for exploration and clarity. There must be variants of the steam engine. 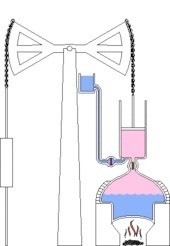 I found the Spilling engine (blue and pink diagram, up and right), suitable for 100-1200kW, aimed at combined heat power plants and (therefore) small biomass, waste heat generation and incineration plant. 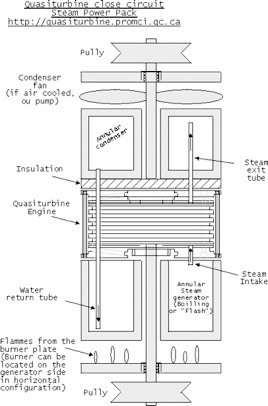 On a smaller scale, there is the Green Steam engine, which is capable of (a world of meaning there) generating energy from the waste heat of other engines. However, the info supply has failed, so one wonders if this was pipe dream or simply too difficult to market. I’m prepared to bet Mr Green has his own engine working. I note that steam engines last a long, long time, not listed as an advantage. I found also the quasiturbine, 2011(right). The linked page is mixed English and French. The engine is a rotary expansion engine. It is not a pure turbine (?) by not having vanes and the article refers to cascade expansions – there’s a load of technical terms in the steam power generation world. I went fishing for compact content and establish that the Quasiturbine is vibration free, efficient and compact. 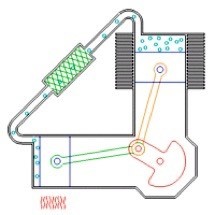 It could be located inside the boiler, as per diagram. I found the naphtha engine, using (any petroleum) naphtha as fuel and working fluid. Thus the fuel also did lubrication. Naphtha is attractive because it has a low boiling point (compared to water). Referring to steam is a potential source of confusion. Steam is the ‘working fluid’ of the EC engine. Most of the engine types are named after their inventor (or the guy with the most successful press agent). I recommend a look at animated engines, which shows well how stuff works (like it says on the tin). Issues with ECEs are (all) described as consequences of the external heat source and therefore point to a place for design development. Because heat is applied externally, it takes time to start up and for the engine to respond to changes, so it can’t change its power output quickly. Both of these complaints would be irrelevant if paired with an electric engine. Use of flywheels and other power storage devices or mechanisms should also be considered. The Stirling engine is another external combustion engine. Wikipedia: a closed-cycle regenerative heat engine with a permanently gaseous working fluid. Closed-cycle, in this context, means a thermodynamic system in which the working fluid is permanently contained within the system, and regenerative describes the use of a specific type of internal heat exchanger and thermal store, known as the regenerator. 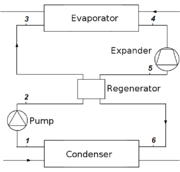 The inclusion of a regenerator differentiates the Stirling engine from other closed cycle hot air engines. .... Most of the many possible implementations of the Stirling engine fall into the category of reciprocating piston engine. There are several different arrangements, one or two cylinders, Ross Yoke, low temperature differential; please visit the animations to review these. The engine needs to warm up – a feature of the external combustion; power output is pretty constant. 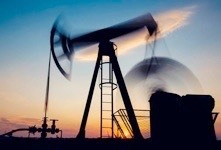 The gas used needs to have a low heat capacity, so hydrogen, helium and nitrogen have been tried, besides air – the oxygen in air tends to go bang with the lubricating oil, which is not good. Hydrogen has this and other problems, including reacting with the materials of the vessel. Stirling engines can be used as heat pumps (i.e. heating or cooling). They are used in underwater power systems and in places where heat (or cold) and power are both wanted. 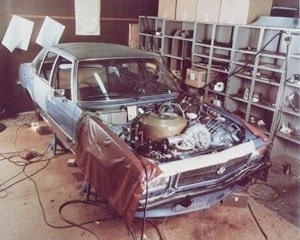 There are a few Stirlings in cars (pic); the attraction is that the motor is clean (depending on the source you choose for the external heat) and efficient [1986 38% thermal efficiency cf 25% from a gasoline engine]. It is quiet. It takes time to start, like 30 secs. 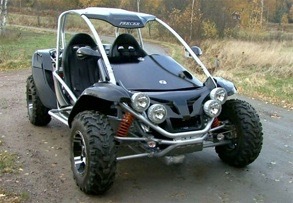 It is difficult to change speed and so looks a good bet for combination with electric motors in a hybrid. See the Precer³ project, from 2007 onwards, running on wood pellets. Stirling engines are promising for aircraft engines (they’ll work well high up in the cold, less vibration, safer fuels). Low power density⁵ issues. Similar to this is the Organic Rankine cycle [ORC]. This is, wikipedia tells us, promising in the fields of waste heat recovery, biomass plant, geothermal plant and solar thermal power plants. The Rankine cycle has a working fluid go to a boiler where it is evaporated, expanded as in through a turbine and then re-condensed. If the fluid is ‘dry’ then the cycle is improved with a regenerator (diagram) acting as a heat exchanger and increases efficiency. The likely working fluids are much the same as we have in refrigerators. I deem this unsuitable for transport systems. I expect there to be a period in which ‘free piston’ is used where free piston electric (or kinetic or linear) generator is more accurate. F-peg speaks nicely. Then there’s the electric motor vehicle, the EV. I suspect the future for a while at least lies with hybrids, but we have several EFVs on sale. Deemed top five in 2014 were the BMWi3, the Tesla S, the VW e-up!, the Renault Zoe, and the best-seller, the Nissan Leaf. I covered some of the issues in Essay 158. I looked also for hybrids on sale. Top five here (autoexpress): Vauxhall Ampera, BMWi3 range extender, Mitsubishi Outlander PHEV, Toyota Prius, Lexus IS300h. There were over 40 hybrid models on sale in the UK at the end of 2014. I wanted, but did not find, relative sales. Help? I have ignored nuclear power, not because I dislike it, but because we are such a very long way from producing anything small enough for other than national grid power plant. Similarly I have ignored solar furnaces and <list for you to consider and contribute to>. I was trying to write about things we can use as power sources for locomotion. If you come across some engine types I’ve missed, do share, please. Email button has gone for security reasons, but you should know mine by now. I’ve placed links within sentences, not as Wikipedia does it, for explanation of a term. I could do this better, but hard luck. 1 electromagnetic suspension: C-shaped arms bracketing the rail hold it ‘up’ and ‘to’ the rail. This is unaffected by speed. 2 electrodynamic suspension has both rail and track putting out fields and uses attraction and / or repulsion to hold the train in place. 3 The Precer group explores biomass powerplants; the Precer Bioracer (this, pic from 2010) uses a Stirling engine running on wood pellets, at about 1kg per 10 km and a 400 Ah battery driving 16hp electric motor. Version Two is more powerful and is suggested to be a two-door hatchback. Basically the company would love to put their drive train in a vehicle of your choice. 5 Power density: power per unit volume, W/m³. Scope for confusion recognised; internal combustion engines measure power per swept volume [watts per cc of engine] where in power cells the volume measured might well measure the enclosing space. see complications here. Energy densities you might like to know One look at energy densities of common fuels is enough to understand while we prefer coal over wood and oil over coal: air-dry wood is, at best, 17 MJ/kg, good-quality bituminous coal is 22-25 MJ/kg, and refined oil products are around 42 MJ/kg. And a comparison of volumetric energy densities makes it clear why shipping non-compressed, non-liquefied natural gas would never work while shipping crude oil is cheap: natural gas rates around 35 MJ/m³, crude oil has around 35 GJ/m³ and hence its volumetric energy density is thousand times (three orders of magnitude) higher. An obvious consequence: without liquefied (or at least compressed) natural gas there can be no intercontinental shipments of that clean fuel. http://www.flysteam.co.uk/steaming.htm talks about canal boat speeds - and then model racing boat speeds, specifically the monotube as a flash boiler for high pressure steam. “Cold to full power in under 10 seconds” “385 bhp per litre”. I loved the men at work sign used to indicate ‘page under construction’. I’ll use that myself. Powered by the same technology as their more popular internal counterparts, External Combustion Engines [ECEs] use a comparable amount of energy and are similar in nearly all characteristics. Their (ECE] efficiency comes from what they do with energy, namely igniting a spark in[side] a vehicle's fuel tank, thereby resulting in a larger and far superior combustion. Because a greater amount of potential energy is converted to kinetic energy with the same energy input, the External Combustion Engine is theoretically more efficient. Spot the errors!! Like my site is free of them, so is that the pot or the kettle being black? Adjacent pages: left here in the hope of a response along Keep/Lose lines.